Brimham Rocks near Summerbridge in Nidderdale. The curious rock formations at Brimham in Nidderdale are scattered over some 50 acres on Brimham Moor and provide a great variety of weird and wonderful shapes. Nidderdale is the upper valley of the River Nidd at first flows south underground then rises to form several reservoirs including the Gouthwaite reservoir, before it turns east eventually joining the River Ouse. The only town in this Dale is Pateley Bridge with other small settlements including Wath, Ramsgill, Lofthouse and Middlesmoor above Pateley Bridge and Bewerley, Glasshouses, Summerbridge, Dacre, Darley, Birstwith, Hampsthwaite and Kettlesing below. Wath sometimes known as Wath-in-Nidderdale is 1 mile north of Pateley Bridge is derived from the old Norse meaning 'ford'. Wath has a local Inn and once had a railway station for the Nidd Valley Light Railway. Ramsgill close to Gouthwaite reservoir and is known for its much acclaimed Michelin- starred restaurant which sits on the village green. Ramsgill also had a station for the Nidd Valley light railway which opened in 1907 and closed 23 years later in 1930. Lofthouse or lopt hus in old Norse meaning 2houses with lofts" is a small village of about 75 souls and comprising of a primary school, post office/shop and a public house. Middlesmoor with about 40 inhabitants lies at the head of Nidderdale. Middlesmoor was first mention in the 12th Century and probable means "moorland in the middle of two streams". This refers to the River Nidd and its tributary How Stean Beck. In the 12th century Byland Abbey established a grange at Middlesmoor. Also of importance is the stone cross inscribed "Cross of St Ceadda" sitting in the Church of St Chad and which shows this as a place of worship since the Anglo-Saxon times. Bewerley with a population of about 700 and was mentioned in the Doomsday Book was originally part of the estates of Gospatric, Earl of Northumbria prior to the Norman Conquest. Over the years ownership changed until it was acquired by the Yorke Family in 1774 and held by them to as late as 1924. Of note is Bewerley Grange Chapel which was built by Marmaduke Huby , abbot of Fountains Abbey. Glasshouses one mile south east of Pateley Bridge is the site of the Old Twine Mill which has more recently been converted for the use of small businesses. There is a village hall and public house and May Day is celebrated with the traditional May Pole dancing and also the crowning on the village green, of the May Queen. Summerbridge sits astride the main road from Harrogate to Pateley Bridge and has a number of amenities including a public house, tea rooms, post office, general stores, butchers, hardware store, Church, primary school and a newly built fire station. 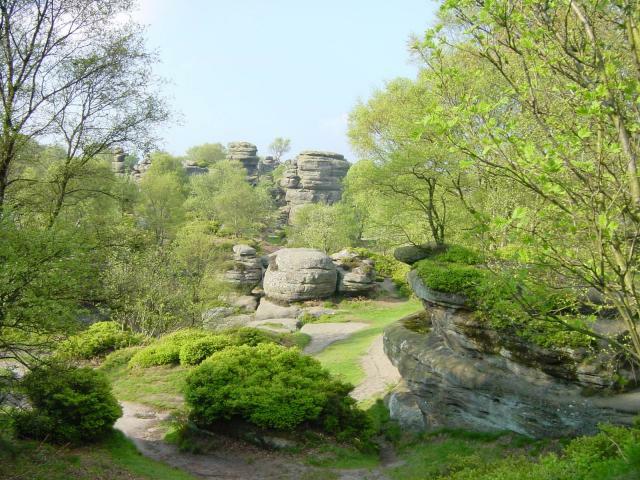 It is also notably the nearest village to the fantastic Brimham Rocks. Darley is a long thin village straddling the road 1 mile from the Junction of the B6451 to the western side at Darley Head. Darley has 2 churches and three community halls as well as a village store, post office, pub and a mill which has been convert to a large mill shop. Also of note is the nearby RAF station of Menwith Hill. Birstwith with a population of about 750 people is situated on the River Nidd. It once had a railway station but as with many small villages it was closed and the line axed with the Beeching cuts of 1960's. The village is server by the Church of England Primary School and the private school, Belmont Grosvenor which occupies Swarciffe Hall. Other amenities include the award winning village store and post office, and an excellent cricket pitch, tennis courts and snooker room..
Hampsthwaite with a population of over 1,000 lies on the south bank of the River Nidd. The village centre is of note and as such lies within a conservation area. The area north west of the village is also recognised as an Area of Great Landscape Value. Hampsthwaite has a village room, post office, shop, pub and Hampsthwaite Church of England Primary School. Nidderdale has lots of wonderful attractions for all the family, the Nidderdale Museum, the Old Work House and Kings Street Workshops. The Nidderdale Agricultural Show held in late September, Glasshouse Mill home to Yorkshire Country wines and a Mill Centre at Darley which is a 17th century listed corn mill with its 27ft water wheel. At the foot of the valley the wonderful Ripley Castle unspoilt for centuries. Brimham rocks are a great place for the kids to explore, these weathered rock formations stand like status in the countryside.